I stumbled upon this 3 Ingredient Energy Bar at this recipe site. I wasn't looking for anything in particular, I found it and realize this is the perfect recipe for an energy bar to bring to work as a quick snack. Rather than buying premade snacks from Kashi, Nature Valley, and NutriGrain that are loaded with extra sugars. The recipe itself is very simple. Equal amounts of dried nuts like almonds, dried fruit like raisons or cranberries, and pitted dates. Since I have a smaller food processor, I used 1/4 cup of each. Throw it all into a food processor and set it to chop and blend them together until it is a fine texture. The bits were very small pieces, but didn't stick together. It took me a total of 2-3 minutes. When it's all chopped up, pour it onto saran wrap and press them together and it's ready to eat. It takes extra effort form the chopped up bits into perfect squares, but the shape has nothing to do with taste. I made a thin layer of the energy bar and cut up small squares. Right out of the food processor, the bits came out slightly warm. So I decided to cool down the remaining bars. It turned it harder, but more of a energy bar texture. I plan on making enough of a batch to take a few pieces to work each day as a quick and healthy snack! 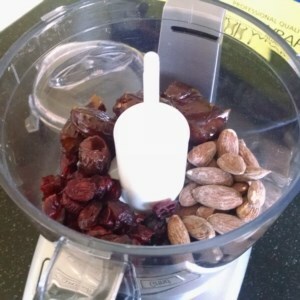 Combine the three ingredients into a food processor. Pulse a few times to break up items, breaking up clumps as necessary for about 2-3 minutes. Put the processed ingredients on saran wrap and press the dough into a thick square (or any shape you'd like). Cut into smaller pieces and enjoy or store for later.